Volunteers from Hamlin and the surrounding area have been working since June 2008 to clear the “jungle-like growth” from the old Civilian Conservation Corps (CCC) Camp on Moscow Road. The campsite is on property that is part of Hamlin Beach State Park and is located just east of the southern entrance to the park adjacent to 968 Moscow Rd. By August of 2012, over 5000 people hours of volunteer work had been put in with hand tools cutting and hauling away the dense brush that had taken over the area. Today the eight acre site looks very much like a park and the work continues. The CCC camp opened in 1935 and was part of a program instituted by the Roosevelt administration to provide relief from the effects of the Great Depression. Healthy young men from needy families could enlist in the CCC, a paramilitary organization, and they agreed to work for $30 a month. They got to keep $5 each month and the other $25 was send home to their families. The 1600+ CCC camps in the country were each assigned meaningful tasks that were designed to be investments in the infrastructure of the nation. (e.g. The government actually got something for the money it appeared to be giving away.) The Moscow Road CCC camp was outfitted to house 200 enlistees and given the task of turning a rather plain and small county park into the beautiful state park that presently sits on the site. The young men were fed, clothed, and provided with educational and recreational opportunities that actually improved the health of the enlistees and boosted their self esteem. The local economies of the communities hosting the camps also improved. In 1941, however, as U.S. manufacturing increased to help supply our allies with war material, CCC enrollment decreased significantly and the camps closed. Our camp had an extended life. Sometime after 1941 the education building, two large garages, the blacksmith shop, the tool repair shop, and an assortment of storage buildings were removed from our camp but the rest of the camp was left pretty much in tact. When the need soon developed to provide housing for migrant workers imported from the Bahamas, our camp was easy to make ready for duty again! When the migrant workers moved out after the 1943 fall harvest, Italian prisoners of war moved in to take their place. However, Italy became our ally a couple of months later and the Italians had to be sent home. But we had a plan B. Early in 1944, the camp was modified to accommodate German prisoners of war. An eight foot high barbed wire fence was erected around most of the camp, guard towers were put in place, the enclosed area was lighted, and a sturdy double gate controlled supply truck traffic into and out of the POW compound. The CCC cots were replaced with double bunks so that the five barracks would now hold 400 men. The first German POWs arrived in Hamlin on June 30, 1944. For a year and a half, the prison population fluctuated with the seasonal labor demands of the local farmers and the area food processing plants. In the fall of 1945, a population record was set and seventeen tents had to be pitched behind the barracks for over a month to handle a total of 452 prisoners. The Hamlin POW camp closed on January 11, 1946. Sometime after that, every building on the site disappeared as if they had been “beamed up.” The sewer system was made inoperable and the water service was disrupted and buried. Nothing was ever built over the site, crops were never planted on the site and no roads were ever built through the site. Nature had free reign and 70 years of runaway plant growth took over the site. 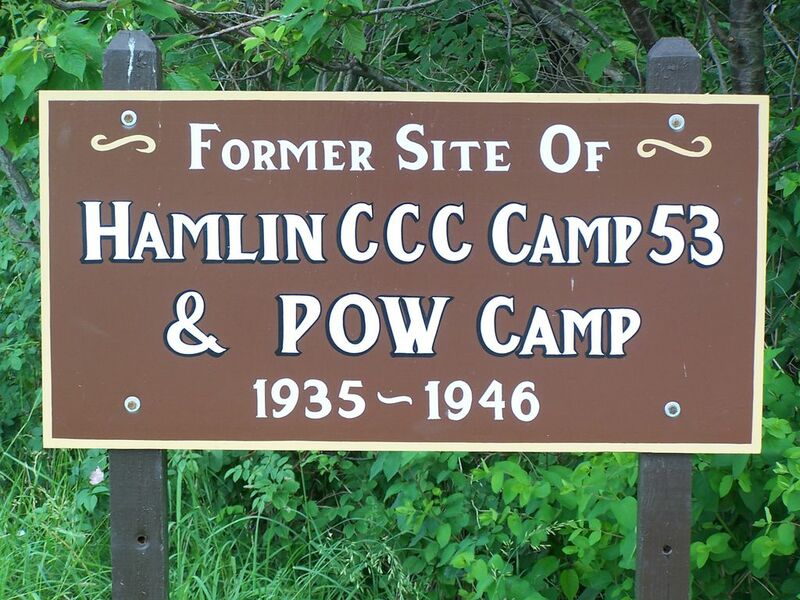 The words “nothing is left of the Hamlin CCC camp” appeared in print several times in the recent past and that helped to keep visitors away from the site. In June of 2008, Park Manager Marty Howden asked for help to turn the site into a history trail because of the role the camp played in getting us through the depression years and the war. When we started pushing aside the fallen trees and lopping the tangled brush and invasive species it soon became apparent that there was, contrary to the newspaper stories, “lots of stuff” left of the site to see! There is a power pole they forgot to take down (with wires on it), broken and unbroken dishes, a bushel of hair tonic, shampoo and mouthwash bottles, cement stoops marking the front and back doors of the barracks, dents in the ground wherever a building sat, the cement work that allowed the saw mill to function, hardware of all kinds, half pint milk bottles and jam jars, prisonyard light pole anchors from the POW era, an aluminum cup a POW “borrowed” from a canning factory, indoor plumbing hookups for the three “privileged” buildings that had that luxury, a futuristic (for the 1930s) chlorinated sewer system, the cement floor of the shower and wash room (all drains still working), a 24 foot long cement privy toilet pit that was once a “sixteen holer,” the entire buried bottom strand of barbed wire that surrounded the camp, coils of barbed wire someone forgot to pick up when the camp was dismantled, POW issue beer bottles, the cement floors of the only two truck bays in a thirteen bay garage that were paved (complete with functioning catch basin), the cement floor of the new POW shower room/wash room that was built after the other one burned to the ground, the cement foundations of the POW camp’s swinging gates, and lots of neat stuff we can’t put names to yet. So far, we’ve marked the exact locations of 18 buildings and have scraped clean over 2800 square feet of cement that used to be the floor of a huge tool building and blacksmith shop, and uncovered the cement floor of a “mystery building.” While we work, please feel free to visit and walk around the site. The volunteer workers you might run into are prepared to provide you with an aerial photo map of the site so you can give yourself a history tour. We desperately need old photos showing what the camp looked like during the POW era. If you know of any, please notify someone at the State Park Office.